Scott Hatfield was one of NCSE’s Grand Canyon Teacher Scholarship winners. He teaches biology at Bullard High School, in Fresno, California. Teachers can apply for a scholarship on next year's trip, and you can donate to the scholarship fund or sign up for the trip now. 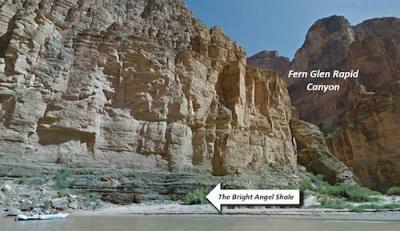 Scott Hatfield's photo of our campsite at Fern Glen Canyon Crack. A short, sharp sound like a gunshot echoed off the walls around me, and in a moment my world changed—again. Rain had come and gone for days in the Grand Canyon, but as I whipped my head toward the cliff behind me, I somehow knew instantly that the clap of sound was not thunder. Overnight, the cloudy skies and thunderstorms of the previous day had given way to startlingly clear blue skies. This was something else. Squinting in the morning sun, I saw a pale yellow plume above, with something heavier glinting in its midst. A downpour, not of rain, but rock. Cobbles and pebbles whistled as they flew by, and a fist-sized shard bounced off the water bucket I was hauling, gashing my thigh. Amid a drum solo of impacts booming and crackling, some deeper than others, I heard cries of alarm from every direction. As I reached the river, the roaring was replaced by a hissing sound, rising above all else and fading into nothing: the sand settling back to the beach after being kicked up by the rockfall. And just like that, it was over: perhaps ten seconds at most of adrenaline for our party, but a moment that none of us would ever forget. It was a reminder that Science really is an adventure, a process of exploration and discovery that, if done right, challenges our expectations and assumptions about what we can know, what we can do, and what we can understand. As a classroom teacher, I had leapt at the opportunity for adventure provided by NCSE’s new Grand Canyon Teacher Scholarship. Any lover of nature might relish an all-expenses-paid rafting trip down the Colorado River for the sheer physical thrill of the experience, but voyaging with NCSE meant that I would also receive expert lessons in natural history in an unforgettable setting. I had known all along that the erosive forces that shaped the Canyon operated on what John McPhee has eloquently termed “Deep Time.” I knew that these forces worked in the same manner in the past as in the present, and were thus called uniformitarian processes: wind, water, and ice reducing and transporting the varied layers of rock over hundreds of miles and millions of years, pebble by pebble, grain by grain. But only living on the river really let me understand these dynamic processes. Weather within the canyon takes on a kaleidoscopic aspect. At one bend, far from white water, you are baked in light bouncing off the rock walls, gently drifting inside the most picturesque solar oven imaginable. Yet within minutes, you are not only wrapped in shadow, but pelted by rain: sometimes drizzling, sometimes pouring. A slight shift in the wind can draw cold air out of shaded sidecanyons, or warm air from the desert above. On the river, the “layered look” is not a question of fashion sense, but a strategy to adapt to the elements: pull this hood down, peel this top off, change with the changes. Beyond the vagaries of wind, sun, and shower, the river itself is flux personified. Heraclitus observed that you can’t step into the same river twice, even without the benefit of having rafted the Colorado. Even he would have been amazed, I think, at how the river changes as you ride down it: drifting by calm coves, bouncing through sprightly riffles, and pounding through crushing rapids where it feels like you’re being showered by the world’s largest bottle of Yoo-Hoo. So, the upshot of all this is that while you are pondering geological time on the river, you are pummeled by the present: amid the physical adventure, there is an intellectual voyage of discovery. From that vantage point, ideas and feelings coalesce in a way that is difficult to explain, but which now seems inseparable. As I pondered the sum of uniformitarian processes at work carving the Canyon, voyaging through this wilderness reminded me that these processes reflect the accumulation of many individual events. Some, like the individual grains of silt moving through the rapids, are nearly invisible to the rafter; others, like a campsite rockfall, are dramatic and unforgettable to those that experienced them. Yet the vast majority of such happenings, past and present, innocuous or spectacular, will leave no mark for future voyagers; they will instead be destroyed by the “conveyor belt” of erosion, transport, and deposition. The sobering truth is that uniformitarian processes in and of themselves tend to generate and multiply mystery, rather than enlightenment, about the history of the Earth. “Flood geologists” committed to a literal reading of Genesis attempt to exploit this situation. They rush to fill the lacunae of our understanding of the Canyon with what they imagine their faith compels them to affirm: a young Earth, and a worldwide Flood, a catastrophe of (literally) Biblical proportions. How ironic, then, that what ultimately confounds their efforts is what the Canyon reveals next: not one, but a succession of real catastrophes written in the rocks. This happens because the “conveyor belt” of the Colorado River is also an “elevator,” whose attendant repeatedly intones, “Going down.” The river bends back and forth in every conceivable direction: here north, there south, and so forth. But regardless of what the compass says at any given moment, the overall trend is one of descent: with each mile on the river, voyagers find themselves further from the rim above them, and bracketed by rock of ever-increasing age. In a very real sense, the Canyon is a time machine. Trilobites, like these from Cambrian rocks in Utah, sometimes appear in Hatfield's classes Over the years I have amassed a fair collection of fossils for teaching purposes, many from the American Southwest. 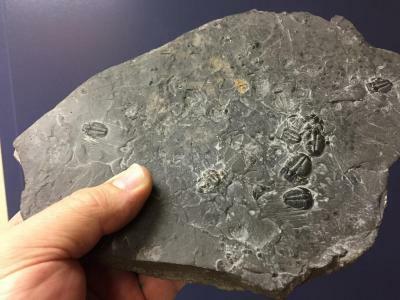 A particularly useful piece from Utah is a slab of black shale containing dozens of trilobites (Eltrathia kingii). As I explain to my students, this is a very common fossil in rocks of Cambrian age, such as the Canyon’s Bright Angel Shale. The many casts and impressions on this single rock no doubt reflect a rapid burial, an underwater landslide that entombed the many arthropods all at once. Ironically, a deposit of the trilobite-containing Bright Angel Shale can be found at the very campsite where I and my river companions were menaced by rockfall. The afternoon before, I had found trace fossils, burrows and castings of creatures buried a half billion years ago, in the talus of rock at the base of the cliff—the very same cliff that, the next morning, would shoot projectiles of much younger age at our expedition! Thinking about it now, I have to smile: I can’t help but indulge the improbable whimsy that I just avoided burial and fossilization myself. More seriously, I have to admit that contemplating extinction is sobering, and especially so for science educators today, due to our familiarity with the processes that imperil biological diversity: habitat destruction, invasive species, climate change. It’s vital that our students learn about these threats to their inheritance, the world that we share with the rest of life on Earth. Yet the stark truth is that a real understanding of these processes can only be gained by acknowledging the scope of geological time, and the nature of biological evolution. Sadly, acceptance of this established science is still far from universal: teaching that the Earth is very old, and that life evolves remains controversial in many quarters, for reasons that have nothing to do with evidence. That is why I am so grateful for the continued role of NCSE in educating the public, providing resources for the classroom and defending the teaching of evolution and climate change. As I hope my essay here makes clear, NCSE’s Grand Canyon Teacher Scholars program gave me opportunities and experiences that I never would’ve achieved on my own, and I would make the voyage again in a heartbeat. All of my fellow voyagers helped make this the trip of a lifetime, but I have to give a special tip of the rapid-soaked hat to NCSE staffers Josh Rosenau and Steven Newton for their leadership, generosity, and encouragement. Equipped with his five senses, man explores the universe around him, and calls the adventure—Science.